Delinquent tax return also referred to as late tax return refers to a tax that is unpaid after the payment due date which in order words might mean a late in filling or payment of tax. 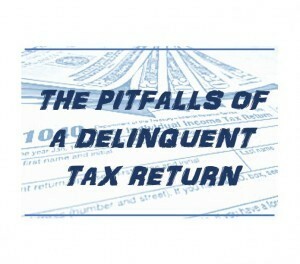 In the eyes of IRS and federal government a delinquent tax return is defined as income tax return having a US mail postmark after April 15th or the latest tax filling due date, if an extension was granted, a delinquent income tax return is defined as an income tax return with a US mail postmark after due date of that extension. Usually, a penalty is attached to a delinquent tax. The power, jurisdiction and authority to collect all delinquent taxes is vested in a state tax commission. Internal revenue service (IRS) policies stated that the enforcement period for delinquent return and filling requirements is not to be more than six years. However, the extent to which delinquent procedure will enforced will depend upon the facts and circumstances of each case and by reference to factors ensuring even handed administration of staffing and other IRS resources. The IRS prepares the return based on information it has from employers, banks, financial institutions and other payers of the person involve. The IRS does not take kindly to people who do not pay their taxes on time and the same holds for people who do not file a return. What If You Don’t Response to a Delinquent Tax Return? No matter how overdue your returns are and no matter what your excuses may be, you must file your taxes. If you don’t file a required tax return by the due date the internal revenue service (IRS) will charge you a 5% per month penalty for failing to file. If you owe taxes on the return, you will be charged a 0.5% per month failure to pay penalty. interest will also accrue on any unpaid balance from the day the return was due until the date you will pay the tax in full. The IRS Can also file a return for you called a substitute for return (SFR). So if you have a refund date, you must file your tax return within three years of the due date of the return or you will lose your refund. The IRS can be very intimating in most cases as on receiving notice from them will raise anyone’s blood pressure. To understand how to deal with it, it is important to understand some steps to be followed to get some tax debt relief. The very important and first step to take is to get help from a licensed tax professional which could be a tax lawyer or a tax attorney, they are pros in this field and know the tax law. They can provide you with tax debt relief which can save you from the intimidation of IRS which can make you start thinking you have no choice than to pay the amount of your tax immediately on receiving their notice. Also consulting with a tax lawyer might make you to understand your rights and options and will make you realize you can file your taxes even if you can’t pay at the moment. This will potentially save you from IRS collection or the IRS filing your taxes for you. As said by Zimmelman, the owner of Westwood tax and consulting, a New York based accounting firm, “The penalty for late filing is 5 percent of the unpaid taxes for each month that the tax return is late.” Your tax attorney might assist you in requesting an extension of time and can also assist you in setting up installment agreement with the IRS. With the help of your attorney the IRS may set up an installment agreement for you if your combined tax penalties and interest is less than a fixed amount of money. Making an offer in compromise can also be a tax debt relief to save you of the challenge of delinquent tax return. Zimmelman also said “if you can prove that you cannot afford to pay the taxes, the internal revenue service might be willing to compromise and reduce your balance”. An important aspect which must not be left out is frequent communication and record keeping which is also important in dealing with delinquent tax return. This can be streamlined if a tax debt relief professional is on your side. It is very importance to deal directly with a tax attorney to help you until you get the delinquent tax return issue resolved to avoid possible consequences such as potential loss of taxes credit as if you qualify for. One must also be aware that if you fail to file a return, the Internal Revenue Service could start some serious collection activities which typically includes tax liens, wage garnishment, bank levies, cooperate responsible person assessment, license and permit revocations, referrals to a private collection agency and other types of property seizures. If you need help, don’t hesitate to contact us today. The consultation is FREE!